After a hard days work, we finally reach home, at the place that comforts us, where we can be ourselves, and its very well said that there is no place as home. Are you among those who like to drink your coffee or your favorite beverage or eat your dinner in front of the TV? And why shouldn't you relax and enjoy in your own home? Aren't you supposed to feel at home at your own home? Then can't we relax, enjoy and eat our food right on a couch watching TV or reading a book and getting off only when it's absolutely necessary? Or how about if there is no room for side table or even if you have a side table or a coffee table and every time you need to take something or put down your beverage, you need to move away from the couch, right? Or how about if you don't have a cup holder integrated into your middle cushion? 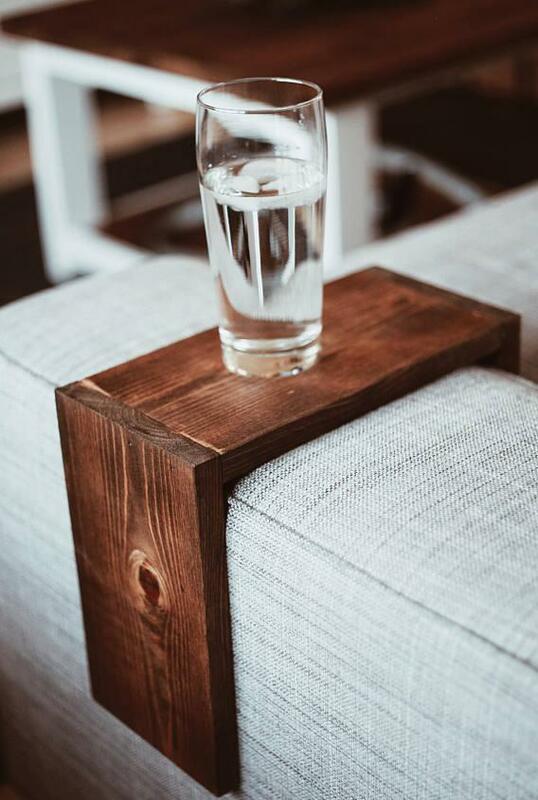 We are always searching for things to make our lives easier, then why do we need to balance our beverage on our armrest or write down notes uncomfortably while watching TV? 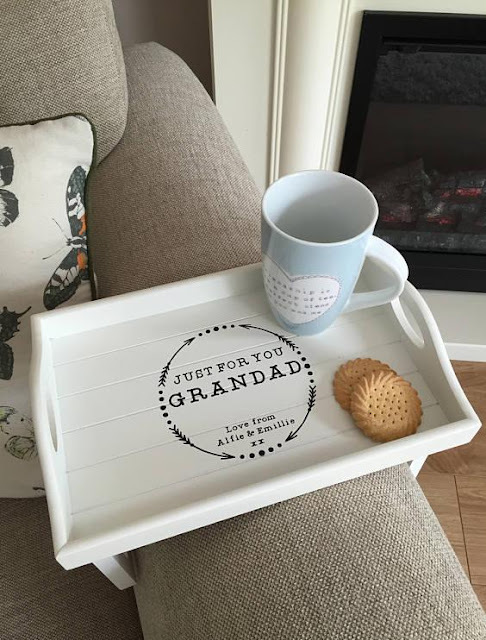 Lounging on the sofa gets even more relaxing with these couch trays, these get everything you need close within reach of where you are sitting. Sofa trays are functional, once you place then on your sofa's armrest and get used to using it, you won't be able to do without them, and after all armrest trays are for those who appreciate their comfort. How about you? Bendable Sofa Tray Table: The bendable sofa tray is a wooden tray that you can place on the armrest of your sofa and it bends and gives you a makeshift table to rest your coffee and eatables. It comes with a linen fabric on the backside that is almost wearproof and provides the needed flexibility to the tray. 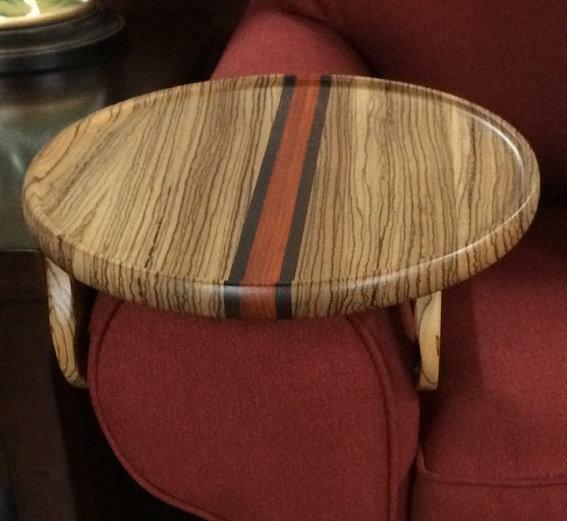 It measures 22.5" x 14" (57 x 35 cm) and is perfect with every rectangular armrest. Buy Now. Couch Tray: The Couch Tray is perfect for rounded sofa armrests, its firmly held in place by the felt backing and wide enough center console while it curves nicely round the armrest for extra holding power. Buy Now. 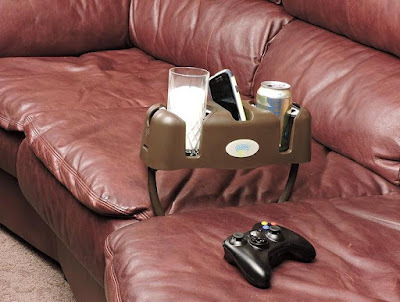 Cupsy - Couch Drink Holder and Organizer: Cupsy is a cool couch organizer that features two cup holders, a center pocket for your smart phone or TV remote, and dual flip down pieces on the front and back to hold two glasses. You can just stick its legs in between two couch cushions and it's ready to use. Buy Now. Armrest Table: The Armrest Table is perfect for those who aren't comfortable with the sofa trays; it doesn't take support or requires the armrest, and stands tall measuring 28 3/4" on its own; perfect for holding your beverages and eatables while you relax and watch TV. Buy Now. 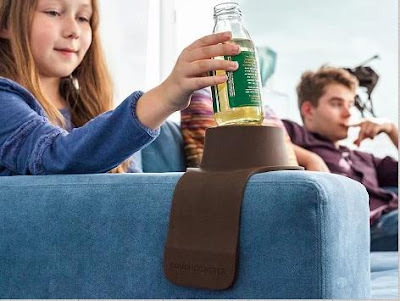 Couch Coaster: The Couch Coaster needs to be placed across the armrests on your couch and it gives your couch armrest a cup holder. The couch beverage holder works with standard sized bottles, cups, cans, and glasses. It comes with flexible and durable weighted band that provides it the stability. Buy Now. 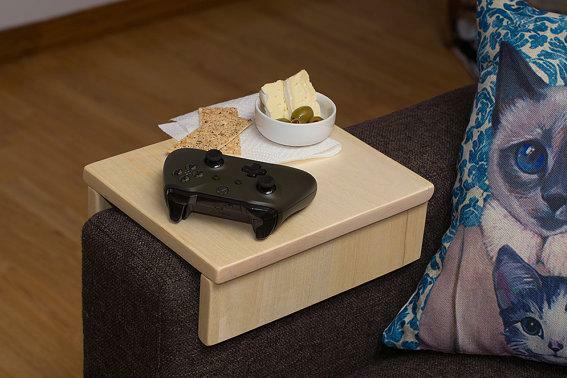 Couch Armrest Table: Sota is a wooden armrest table that works with any size of armrest and features a stand for your smart device and smart phone up to 7". 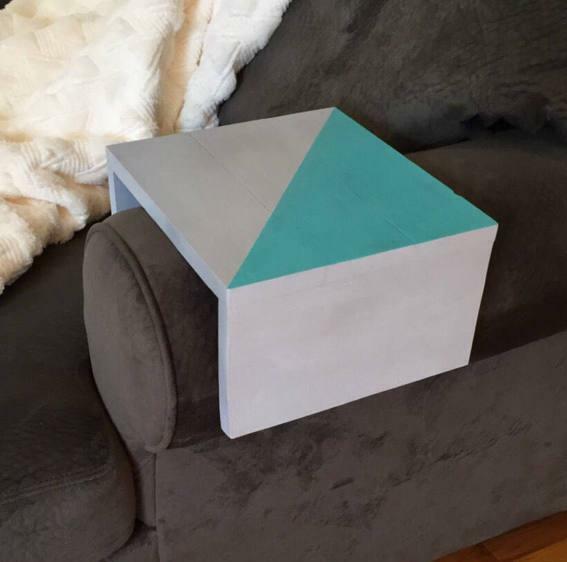 The central part of this cool side table can be used as a sofa tray. Buy Now. 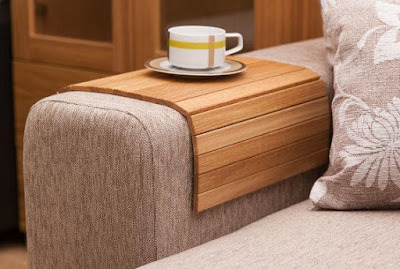 Sofa Armrest Table: The Sofa Armrest Table is made of wood and has color of oak veneer, measures 25 cm x 34 cm, 25 cm x 40 cm, 25 cm x 46 cm and works with every rectangular armrest. Buy Now. 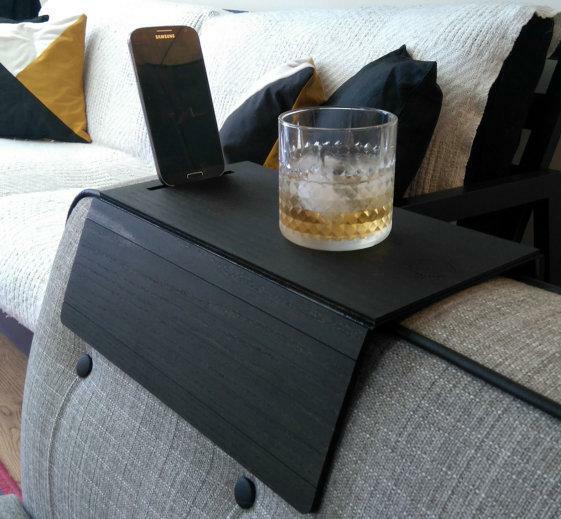 Sofa Tray Table: The Sofa Tray Table comes in oval and rectangle shaped tables, which can be placed over the armrest, and gives you functional tray for beverages and eatables. Buy Now. Couch Armrest Table: The Couch Armrest Table is a beautiful combination of a tray and a cup holder, works perfect with any flat armrest, and is completely customizable with any size, any color. Buy Now. 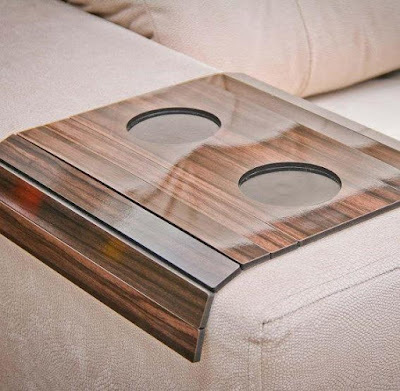 Sofa Coffee Table: The Sofa Coffee Table is a bendable armrest tray, but unlike the other bendable armrest trays, this one has a wider center part, and is perfect with any rectangular armrest. It's made of wood and has white color. Buy Now. 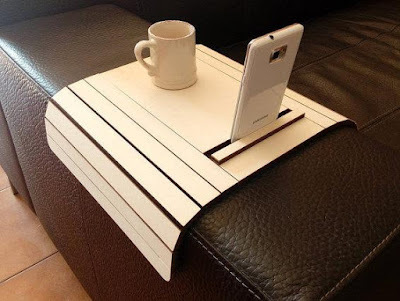 Couch Table: The Couch Table can be placed over the armrest, is made from metal, its durable, perfect to hold your TV remote, smart phone, beverages and more. Buy Now. 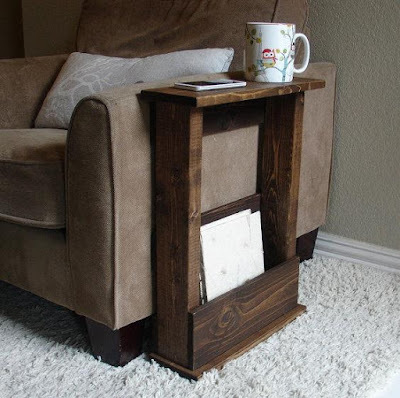 Sofa Armrest Table Stand with Storage Pocket: The Sofa Armrest Table Stand is a handcrafted tray table stand with storage pocket for your newspapers, magazines, remote and more. 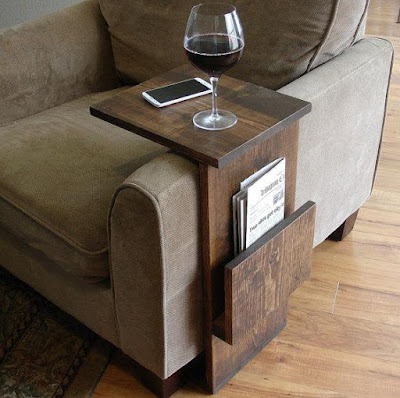 It doesn't require support of armrest, and can also be used anywhere around the house. Buy Now. Couch Armrest Table: The Couch Armrest Table is a minimalist looking tray; and won't interfere with your interior style. 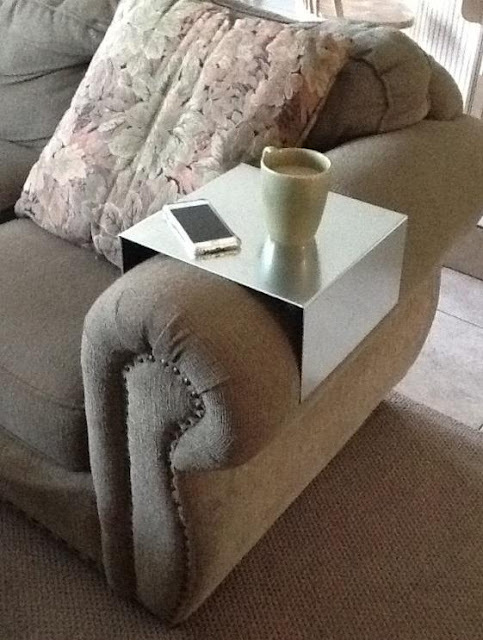 Just place it over the armrest and get a stable surface/tray for your remote, smartphone, coffee, eatables and more. Buy Now. 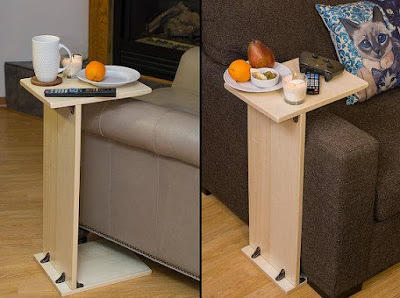 Sofa Armrest Tray Table Stand: The Sofa Armrest Tray Table Stand is a handcrafted tray table stand that comes with side storage for your magazines, newspapers, and is perfect for your sofa chair. It doesn't require armrest support and also can used anywhere around the house. Buy Now. Flexible Sofa Tray: The Flexible Sofa Tray features a wider center part that features rubber coasters, and it works with squared and lightly rounded armrests. 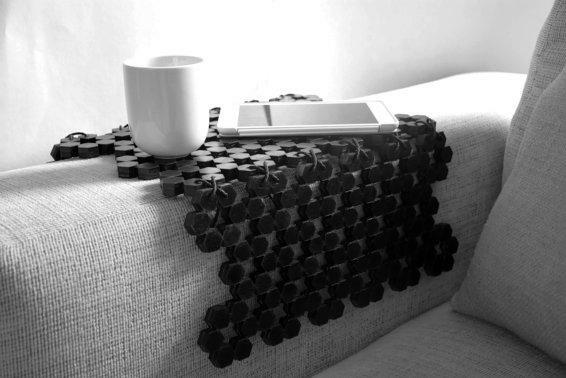 You can also use it on flat surfaces, carpets, coffee table or couch. Buy Now. 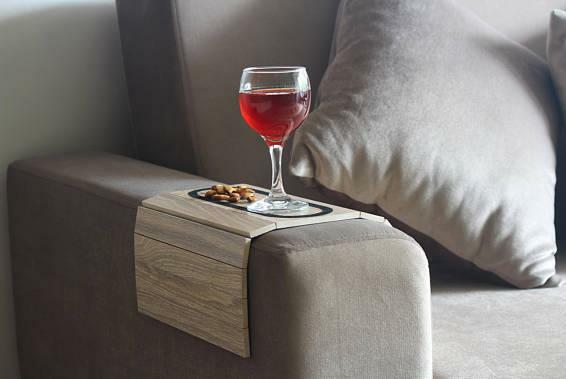 Personalized Sofa Armrest Tray: The Personalized Sofa Armrest Tray is a rectangular tray, its legs hold onto the armrest and gives you a stable surface for your beverage, eatables and more. It measures 12'' x 8'' approx and also doubles as a normal tray. Buy Now. 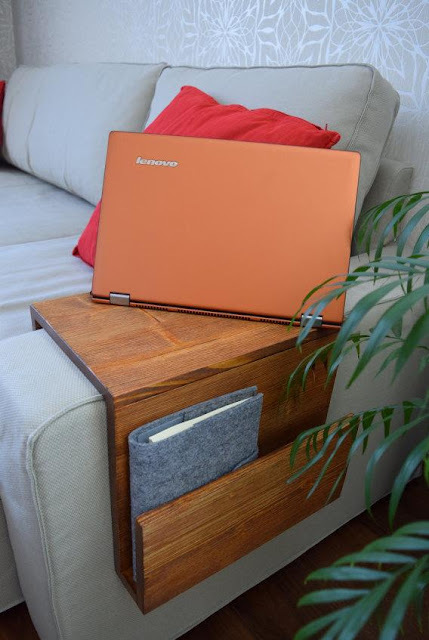 Couch Armrest Laptop Table Tray: The Couch Armrest Laptop Table Tray is a handmade wooden couch armrest laptop table tray with side storage for magazines or books. You can use it as a laptop table, side table, worktable, or just coffee table. Buy Now. 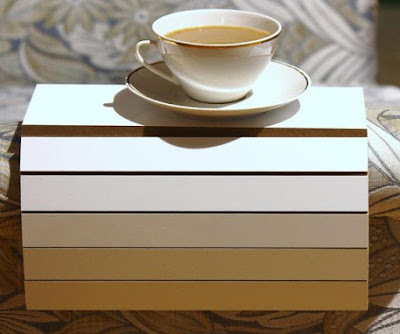 Coffee Side Accent Table: The Coffee Side Accent Table is a multifunctional tray with geometric ornamental pattern, sits comfortably on your sofa's armrest and supports your coffee cup or your glass of favorite beverage while reading, or even works as a laptop table when relaxing on the couch in front of the TV. Buy Now. 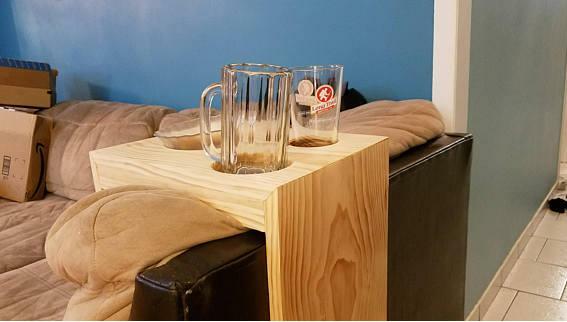 Sofa Table Tray: The Sofa Table Tray is a perfect option when you have no room for a side table; it gives you the needed tray/table for your beverage while watching TV. Buy Now. Sofa Wooden Armrest Tray: The couch caddy sits on your sofa's armrest, features a side tray, cup holders built in and side storage for your books or newspaper. Buy Now. 15 Unusual Tables and Cool Table Designs - Part 3.